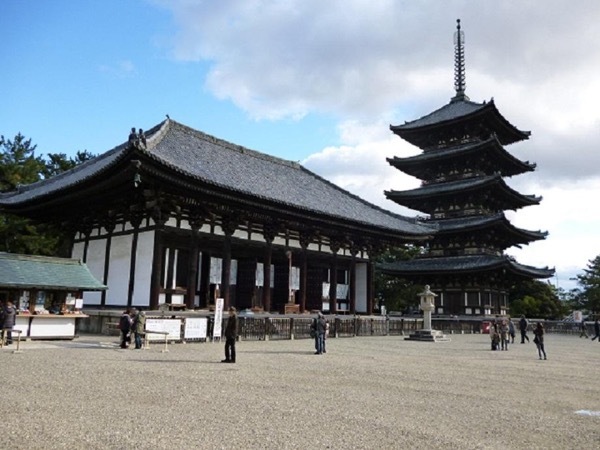 Traveler Reviews for Private Tour in Osaka, Japan by Tour Guide Ken S.
Discover the secrets of Great Buddha with a knowledgeable local guide. Great tour! Ken was very prompt in meeting us as we got off our ship. I had previously communicated to Ken as to what I wanted to see in Kyoto since we only had the one day to see so much. He was very accommodating and gave us a lot of insight into Japan and Kyoto. We were very happy with all that we saw and experienced. I would definitely recommend Ken to anyone visiting Osaka, especially if they want to visit Kyoto! Ken was punctual in meeting us at the Kobe Harbor. He expertly guided us using the train and subway system to from Kobe Harbor to the Nara Deer Park. At the park, we saw many deer, temples, ponds and cherry blossoms. Ken provided us with much interesting information. We also had a tasty lunch at the Park. Overall, we had a fantastic day. We had a fantastic day with Ken. He is a knowledg guide, and made sure we experienced the most of our day in Kyoto. Taking public transportation was great. We all highly recommend Ken as your tour guide when in Osaka. TOUR GUIDE RESPONSE: Hi Arlene, Thanks for your five stars. Hope you will bring great memories back home. -Ken S.
TOUR GUIDE RESPONSE: Thanks for your five stars. -Ken S.
TOUR GUIDE RESPONSE: Hi Kenneth and Ruth, Thanks for your five stars and comment. I enjoyed your companies too. Looking forward to meeting you again. -Ken S.
TOUR GUIDE RESPONSE: Hi Mike, Thanks for your five stars. I hope you have brought great memories on Kyoto back home. -- Ken S.
Ken is a fantastic guide, very enthusiastic and friendly. Attentive to our needs, he was able to arrange a wheelchair through the private transport driver so that my limited mobility father can get around in. We got to see a lot with him, he knows of a lot of hidden views in each location that we would have missed if it was not for him! TOUR GUIDE RESPONSE: Dear Hao-san, Thanks for your five stars evaluation. Hope you will have great memories back home. -- Ken S.
TOUR GUIDE RESPONSE: Thanks David, for your five stars. -- Ken S.
TOUR GUIDE RESPONSE: Thanks Patricia, for your evaluation. Ken S.
TOUR GUIDE RESPONSE: Dear the Cairney, Thanks for your five star evaluation. I appreciate your cooperation during the tour. Looking forward to meeting you again in Kyoto. Sincerely, Ken S.
I booked this tour at very short notice. Ken was waiting for us as we got off the ship. we had a wonderful day, in Osaka and Kyoto. Ken took us on public transport. We said we wanted to go on the bullet train and see local things. He did much more than we asked for. We enjoyed a local meal. I would thoroughly reccommend tours by locals. Ken was excellent, Knowledgable, & friendly. TOUR GUIDE RESPONSE: Dear Wendy, Thanks for your five stars evaluation. I hope you have enjoyed your cruise ship journey with your wonderful friends. Looking forward to seeing you somewhere in the world again. Ken S.
Ken was fantastic as a tour guide. He took us to more places and showed us in detail more than was expected, and he became a friend as soon as we met him. We would recommend him to anyone. Ken's insight and knowledge about all the sites that we visited in Kyoto, ie, Nijo Castle, the Golden Pavilion, Hiean Shrine and Gardens and the Kyoto Imperial Palace was extensive. He picked us up at the port of Osaka at the time agreed and showed us how to use the subway system which prepared us later for Tokyo. His choice of the Japanese restaurant for lunch was excellent , and after a full day of sightseeing (10 hours) he returned with us safely back to our ship. We thoroughly recommend Ken . TOUR GUIDE RESPONSE: Dear Des, Thanks for the highest ranked evaluation. Looking forward to meeting you again. Sincerely, Ken S.
Our group of four thoroughly enjoyed our day long tour of Kyoto with Ken. Prior to the trip, Ken and I worked out the schedule for the day to our specifications. He was very well prepared and explained all the sights to us in detail. It was a perfect day and we all enjoyed his tour very much. We wouldn't hesitate to use his services again and we highly recommend his tours to anyone traveling in his area of Japan. TOUR GUIDE RESPONSE: Dear Kyle, Thanks for your evaluation. Looking forward to meeting you again. Sincerely, Ken S.
Ken is a wonderful guide!!! TOUR GUIDE RESPONSE: Hi Eduardo, Thanks for your comment. Looking forward to being with you in Japan next time. Best regards. Ken S.
Ken is a great guide. We were a large group of 9 with both young & old. Ken was patient, flexible & shared with us interesting historical information of the places we visited. Our lunch venue that Ken arranged had very delicious Japanese food. Everyone enjoyed the trip and our kids (and adults too) were especially thrilled with all the free roaming deers! Our rating for our dear Ken san. Whatever it is, Ken san is God sent. He is one of the best Tour Guide we came across. He speaks good English and is really helpful, even take the trouble to come over to our hotel to teach us how to take public transport to the airport as one of us have to leave one day earlier. We were really touch by his kind gesture. If we visit Osaka again, we will sure engage him again.